Out of my curiosity, I have a question about this small etching press. 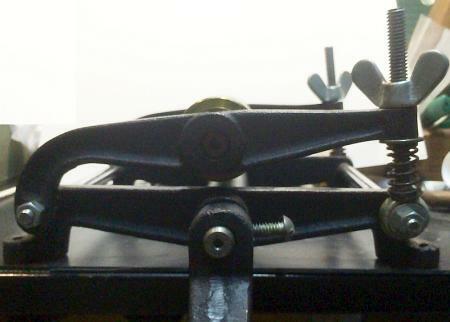 See how the axis of the top roller moves /shifts when the bed-plate gets thicker as the way of the press is built. I wonder how the placement of the axis of the top roller would affect printing. This may be about simple physics or mechanical engineering. I dont’ know… Could anyone explain? This question leads to how thick the bed-plate could be to this press. I have a thin steel bed-plate which is warped so I am thinking to get a thicker one. But if the top roller placement will be matters, I will stick to a thin bed plate. might be the translation.as you have a japanes handle? ..”etching press’….not seen one like this, usually soft blankets are used to emboss/deboss paper into image…..but if trying to print photopolymer letterpress)is that the yellow we see?) 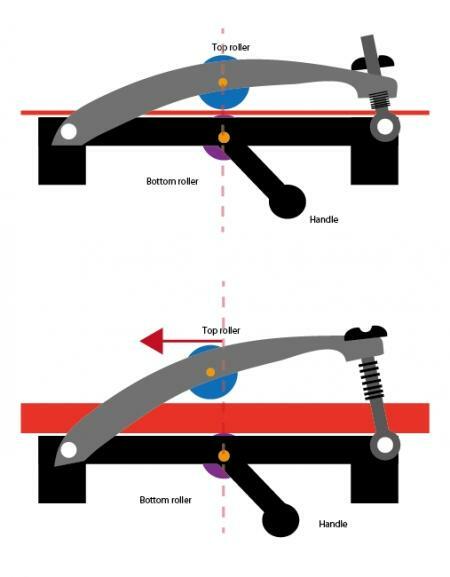 I see not absolute control over roller height because you are 50% relying on a spring to keep rollers away from printing surface…….seems to me you are trying to do 2 mismatched things….I am puzzled. ShuheiFujikura- that is a great little press! 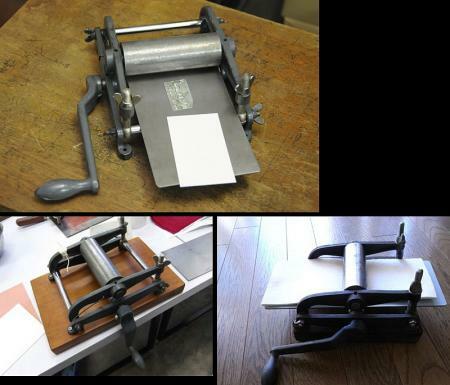 I used one very similar to yours for a number of years, and it worked like a charm for woodcuts, photopolymer and intaglio printing. The useable thickness of the bed is partly determined (oddly enough) by the diameter of the cross-bar at the pivot end, since it acts as “recieving roller” when the bed and block are rolled through. The roller alignment does shift toward the pivots as the bed/block thickness increases, but as long as the bed and block (or plate or whatever ) will pass through without striking that bar and/or flexing the bed, it’s fine. My press didn’t have a bed when I got it. I used a 1/4” (6mm) piece of aluminum and never had a problem with it. 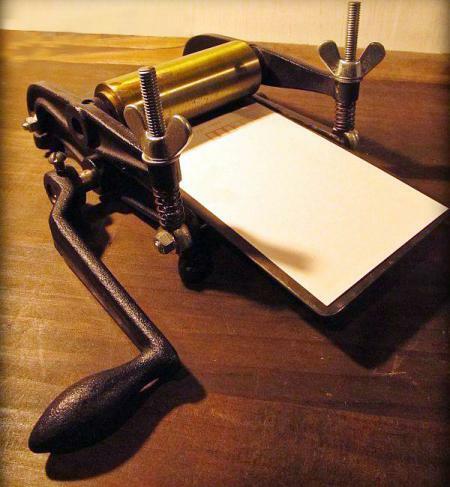 winking cat press - I am glad to hear from someone who has actually used this little press or at least similar one. Thanks for sharing the information of this press. I like the size of this little press and it is portable. If I want do a small project up to the size of postcard, this desktop press would work great. This is the smallest press I have seen so far. Do you still have yours or a picture of the press? unfortunately, no. I can’t find any pics. I had it back in the pre-digital days, and it cost money pictures….. so I ddn’t take as many as I do nowadays. A few years ago, a sligthly larger version of that press was marketed by Faust Ink co. Instead of being made with castings, it was fabricated with welded steel tubing. It looked like a very good press, but unfortunately didn’t stay on the market very long. You may be able to find a pic of it online.